The U.S. Equal Employment Opportunity Commission filed a complaint yesterday against Fox News for a gender and age discrimination case dating back to 2007. According to the complaint, in 2007, she made several complaints to Fox management alleging she had been discriminated against for her age and gender. Fox investigated but found no evidence of discrimination. The next year, the company asked her to sign a contract including language that she would not pursue further discrimination complaints, which she refused. 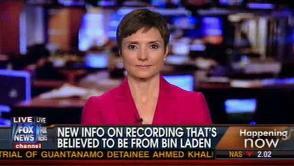 But according to Brandi, the case was resolved in March 2010, with the EEOC saying at the time, “there is insufficient evidence to establish a violation of the statutes as to these allegations.” Also, Herridge is clearly still an employee with the company – the image above is from her reporting on the network today. Also, A Fox executive tells Mediaite, “the EEOC’s press release omits the fact that Herridge demanded to be paid in excess of $900,000 (a 96% increase) in the first year of her proposed new contract with escalating salary increases thereafter, and that’s why her new deal was not signed until June 2009. When her salary demands became more reasonable, the contract was signed.” Sources in a position to know say Herridge is among the D.C. bureau’s highest paid correspondents, making more than $500,000 a year. Catherine filed her charge two years ago. Before and after that date she has been working for FOX News and on the air consistently. She has not lost a penny in salary. She was not fired, nor was she retaliated against nor discriminated against as the EEOC concluded in its own Determination. We at FOX News are proud of our record of compliance with the law. We imagine this won’t be the end of the story.